(Nanowerk News) Like a band of detectives surveying the movement of a criminal, researchers using photographic technology have caught at least one culprit in the act. 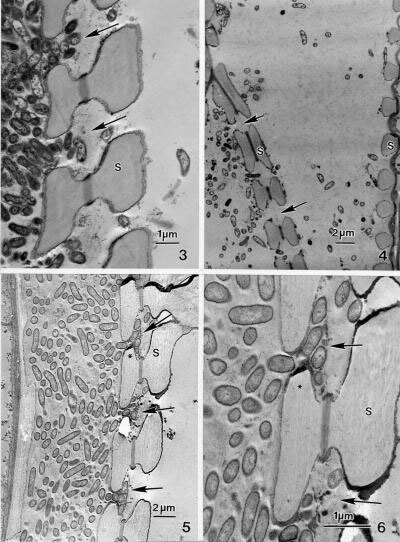 In this case, electron microscopy was used to watch a deadly bacteria breakdown cell walls in wine grape plants – an image that previously had not been witnessed. The study will be published in Botany. "Basically, we've been interested in determining how the bacteria moves," said Dr. B. Greg Cobb, Texas AgriLife Research plant physiologist in College Station. "How do they go from one part of the plant to another?" The death of wine grape plants from Pierce's Disease is a serious threat to wineries from Texas to California, Cobb noted, and no one has been able to stop or reverse the effects of the bacteria that is injected into the vines by an insect known as the glassy-winged sharpshooter. The bacteria that causes Pierce's Disease, Xylella fastidiosa, colonizes a plant over a period of time causing it to weaken and die. "It can be a matter of a few years or more quickly, but plants tend to stop producing before they die, so growers will pull them out of a vineyard," Cobb said. Electron microscopy enabled researchers to see for the first time how a bacteria that kills grape vines is able to move through the plants at the cell level. Cobb and his team of researchers zeroed in on the "matchstick" effect of Pierce's Disease. Plants suffering from the disease drop their leaves, but the petiole - or stem that connects a leaf to the vine - remains, resembling a matchstick. This occurs over the length of the vine no matter where the initial insect injection occurred, Cobb explained. "We've been looking at that area because we think that is a very important indicator of Pierce's Disease, but it also indicates that something is going on there," he explained. The xylem of a plant is like a pipe with a spring in it which transports nourishing water to various parts of the plant. The bacteria that causes Pierce's Disease, Xylella fastidiosa, moves through the plant in this way. "What is happening is that the bacteria is actually able to degrade and move through these very thin parts of the cell wall between the xylem elements," Cobb said. "You can actually see them in the 'pit membranes' that are the borders between adjacent cell walls." The researchers focused the electron microscope at 100,000th of a millimeter along the pit membrane. The membrane normally blocks larger particles from passing through the pits that are located in the xylem, but high-level photographs show the bacteria breaking down the membrane in order to get through the plant. Cobb said the study examined syrah and cabernet sauvignon plants because they have been known to be impacted by Pierce's Disease. In the field, they selected leaves that were still viable but had some "scorching" or water stress which indicated the disease was present. "Then we isolated that very small part at the pit membrane and down the stem or petiole and looked at the xylem there," Cobb said. "To basically see the breakdown of the pit membranes had not been seen before." Water stress contributes to the death of the Pierce's Disease-infected plant, he added, but it may not be the only factor. With this information and the photographs to illustrate the process, Cobb's team continues to study the disease in hopes of figuring out what could be done to help an infected plant live longer.